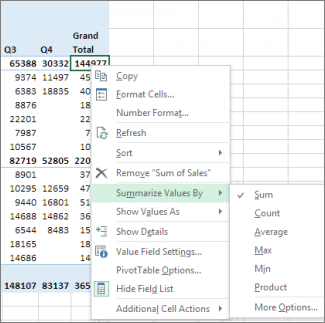 To aggregate (sum) values in a PivotTable, you can use summary functions like Sum, Count, and Average. In the PivotTable, right-click the value field you want to change, and then click Summarize Values By. Click the summary function you want. Note: Summary functions aren’t available in PivotTables that are based on Online Analytical Processing (OLAP) source data. The sum of the values. It’s used by default for value fields that have numeric values. If your field contains blanks or nonnumeric (text, date, or Boolean) values when you place it in the Values area of the Field List, the PivotTable uses the Count function for the field. After you've placed the field in the Values area, you can change the summary function to Sum, and any blank or nonnumeric values are changed to 0 in the PivotTable so they can be summed. The number of nonempty values. The Count summary function works the same as the COUNTA function. Count is used by default for value fields that have nonnumeric values or blanks. The number of unique values. This summary function only works when you use the Data Model in Excel.